Stephanie Anderson is part of our staff at Eternal Perspective Ministries. She is a delightful and godly follower of Jesus, and I deeply respect her. Steph is also a skilled editor who helps me on my books, and blogs. She’s one of the most talented people I’ve ever known. And as you’ll see, she’s an excellent writer too. Steph’s husband is Dan Anderson, and their daughters Evelynn and Sienna are ages 7 and 2. When Steph recently lost her baby Isaiah, after receiving a prenatal diagnosis of Trisomy 18, Nanci’s and my hearts were deeply touched. We had the privilege of attending Isaiah’s memorial service in the home of their pastor and my long-time friend Barry Arnold, of Cornerstone Church in Gresham, Oregon. Both secular sources and Christians say there’s something powerful about gratitude—something about the act of giving thanks that changes us. Scripture says, “I will offer to you the sacrifice of thanksgiving and call on the name of the LORD” (Psalm 116:117). Choosing to give thanks is sometimes more of a sacrifice than at other times. There is still so much I don’t understand about my recent pregnancy and the “whys” of God allowing certain situations, including our son's chromosomal abnormality. Isaiah’s whole life was a surprise to my husband Dan and me, and though we never felt the timing was ideal, we knew we would love this child when he or she arrived, just as much as we love our girls. My pregnancy with our oldest, Evelynn, was a surprise too, but as the months went on and we knew we were expecting a healthy little girl, we found it easy to thank God for the unexpected blessing of her life. I felt strongly that God had a special purpose for creating her and the timing of her life and birth. I admit it was harder to affirm this time when everything seemed like such a disaster. 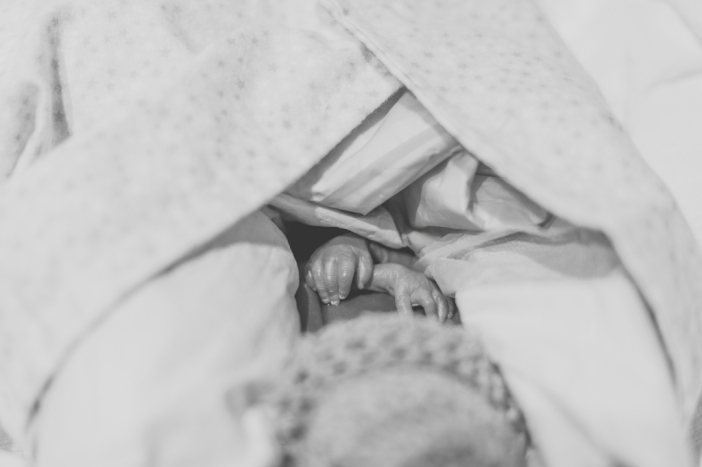 I struggled to find joy in this pregnancy, and after we received our news, I wondered, Why did God give us this surprise, only to give us a baby boy that has Trisomy 18? But I know there’s value in thanking God for Isaiah’s little life, no matter how short it was and how broken his little body was. I want to keep the practice, even if I don’t always feel like it or see the “why” in the moment. We had already previously planned for our girls to spend this particular weekend with their Nana. They were safe and would enjoy time with her, and we didn’t need to worry about childcare. We had a restful night’s sleep, the best both of us had experienced in a long time. Because I had some forewarning with Isaiah not moving, I had time to prepare my heart for the news, and also time to put some things in order for work and our home. The doctor’s office was so accommodating, fitting us in to get an ultrasound. After the ultrasound, our doctor’s office got us scheduled to have a photographer from Now I Lay Me Down to Sleep take keepsake pictures after Isaiah’s birth. That meant the world to me. The sunshine that Saturday morning was beautiful. After days of gray, dreary Oregon rain, I loved seeing the sun and the fall colors it brought out on the trees. A few weekends before, our pastor had talked about “adversity friends”, the kind of friends who rally around you in times of difficulty. What a precious gift our friends and family were to us in this time, with their acts of love, words of kindness, and prayers. They have taught us how to love others in their times of adversity. When I was driving to Bible Study the week prior to our baby’s home going, I found myself praying two things: that Isaiah would know that he is loved, and that the Lord would take him peacefully into His arms. I had no idea God would answer those prayers so quickly. “I am going to Heaven,” Danny replied. “Who is Azar?” Dr. Larimore asked. “Not that I remember,” Dr. Larimore said. “Well, because he says he’s your guardian angel too, and your wife’s and Kate’s [Dr. Larimore’s first daughter],” Danny explained. …I could not remember telling anyone the story of my afternoon after the loss of our unborn child—not even Barb. How we look forward to meeting our son. Heaven is sweeter with him there. Thank you, Lord, for Isaiah’s life. 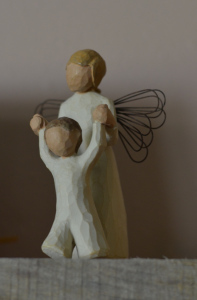 In an earlier blog, Stephanie Anderson, on our Eternal Perspective Ministries staff, told the story of her disabled son Isaiah who died before his birth. Here Steph speaks of her beloved sister Tricia, who had a different disability. When she speaks of God’s sovereignty in birth defects, she speaks with an extraordinary amount of experience and insight.